This week we are joined by BollywoodGora (AKA Steven Baker), writer for BollySpice and DigitalSpy and Upodcast regular FilmiGirl. 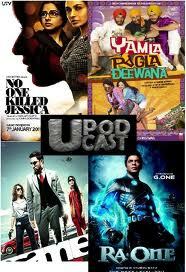 We discuss some of the lessons we as Bollywood geeks have learnt and what we hope to avoid in 2011. We breakdown the upcoming releases in 2011, the ones we are looking forward to and the actors and actresses we want to see more of! Of course we can’t avoid adding our own little snarky twist to everything! Check out the episode after the jump! Of course you can add us on Facebook / Twitter or Subscribe in iTunes and never miss an episode! Do leave us a comment if you liked the show or agree or disagree with our points of view. 2010: the year of good but not great movies? How do stars react when their movies fail? What do we want to see more (less) of in 2011? Thanks to our guests BollywoodGora and FilmiGirl. You can follow more of their work by clicking on the following links!